Let Us Turn Your Backyard Into Your Own Private Paradise! West Coast Pavers, Inc. specialty is designing custom pool decks and patios. Have a large Commercial Project in mind? Contact or email us today for a free estimate. West Coast Pavers is a family owned and operated company, founded in June of 1999 and operating as a interlocking brick pavers contractor in Fort Myers since that time. Call 239.590.9834 now! 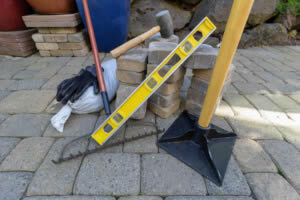 We offer a variety of services including interlocking brick pavers for (commercial and residential applications) including, brick driveway installation, walkways and patios, as well as lanais, pool decks and coping. In addition we have a wide variety of materials to choose from including interlocking brick pavers, tumbled pavers, chicago bricks, pre-cast stones, marble/travertine and tumble marble. As a result West Coast Pavers will strive to earn your trust through competitive pricing, high quality workmanship and providing you honest guidance to make your project affordable, without compromising the quality of the final product. We're here to serve you with the knowledge and quality you deserve. West Coast Pavers provide professional concrete interlocking brick paver design consultation, and installation service. We offer prompt service to homeowners, designers, contractors, and property managers throughout Southwest Florida. West Coast Pavers is conveniently located in South Fort Myers, FL near Alico Road. West Coast Pavers strives to maintain the highest standards during the project, while exceeding all the client’s expectations at all levels of the installation process. In conclusion, we are a Brick Paver Contractor dedicated to serve all of Southwest Florida, including Lee and Collier County , and all surrounding areas . When you are ready for "worry free" brick paver contractor, contact WEST COAST PAVERS, Inc.
Our commitment as a contractor is to build value and deliver professional service in every project we are involved in. We are committed to providing exceptional customer service and quality in the entire construction process. Excellent results! Our projects turned out better than we could have imagined. Thank you for your hard work and professionalism. We will be happy to recommend you to our friends and neighbors. I had a wonderful experience with West Coast Pavers. I'm thinking about doing another job in the near future. Will definitely be giving them and call and I would reccomend to anyone who needs a job done. West Coast's team was fast, efficient, and incredibly neat. This is the second job they have done for us. The first job was much larger and handled just as well as the second. We highly recommend this company. The job was on time, on budget and very professionally done. My wife and I would recommend this company to anyone looking for first class, prompt and cost effective brick paver installation or maintenance.